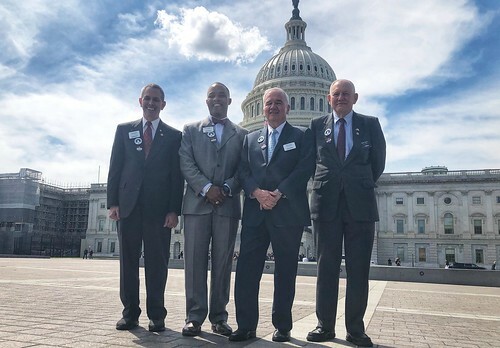 The sun shone brightly with barely a cloud in sight on April 10, but a storm was brewing members from the Military Officers Association of America canvassed Capitol Hill and called on Congress to protect benefits our servicemembers, veterans and military spouses have earned. A 3.1 percent pay raise for the troops. Read more about these issues and Storming at www.moaa.org/storming2019. MOAA's North Dakota team - Lt. Col. Christopher Lindberg, USA (Ret) and Chief Warrant Officer 2 Greg Acs - focused on TRICARE and the pay raise during a meeting with Sen. John Hoeven's office. “There's a lot of things I want to get done,” said Lindberg, who served as an Army infantry officer for more than 20 years. It's the second year Lindberg has traveled from Fargo to meet with legislators. Beth Conklin, a member of the MOAA Spouse Advisory Council, stormed for the first time and met with members of the Colorado delegation. Her husband is an infantry officer in the Army and preparing for his first battalion command. She's lobbied the Hill before, on spouse employment issues, but storming with MOAA was a new experience. This was the fourth storming for Lt. Col. Shelly Kalkowski, USAF (Ret). She was armed with the facts (for example, did you know Colorado is the 10th most populous state for troops and DoD personnel?). She was also determined to get 100 percent support from Colorado's two senators and seven Congressmen for a repeal of the widows tax. There are only two remaining from Colorado who have not co-sponsored, and Kalkowski made sure to get face-to-face chats with each of them to ask their support. Coast Guard Lt. J.G. Rachel Johnson, a member of the MOAA Currently Serving Advisory Council, stormed for her first time. She said it was “extremely rewarding” to represent the needs of junior officers serving today. “To get this perspective at this point in my career is invaluable,” said Johnson, who is also a prior-enlisted Marine. MOAA President and CEO Gen. Dana Atkins, USAF (Ret), said the members brought a high level of expertise and knowledge on all three storming topics. But they weren't the only ones. “When we're going in the offices, I'm extremely impressed by the understanding of Congressional leaders and their staffs on the issues,” Atkins said. Rep. Pete Stauber (R-Minn.), husband of Air National Guard veteran Jodi Stauber, pledged his support to all three of MOAA's storming initiatives. Stauber said feedback from MOAA members helps his office shape legislation in support of veterans' needs. Stauber has already signed on as co-sponsor for legislation that would end the widows tax. Retired Brig. Gen. Tim Kennedy, who served 37 years with the Army National Guard, was accompanied by his wife Sue as they visited Stauber and nine other federal lawmakers from Minnesota during the annual Storming the Hill event. He was pleased with Stauber's continued support of veterans and their families. During each of his visits, Kennedy discussed MOAA's push to end the widows tax. He said at least three lawmakers pledged to sign on as co-sponsors, including freshman Congresswoman Rep. Ilhan Omar (D-Minn.) . "What I hope to achieve is that we move the needle on SBP-DIC [the widows tax]," Kennedy said. "And we did that." MOAA Chairman Adm. Walter Doran, USN (Ret), noted that Storming the Hill has become a vital tradition for the association. “It's important that we do this because we represent the best interest of our members, across the country. We are a trusted source,” Doran said. But it's just one part of our advocacy strategy to improve the lives of our members and all currently serving troops, retirees, veterans and their families. MOAA has more than 400 chapters around the country. Get involved in your community by finding the one closest to you and joining today!